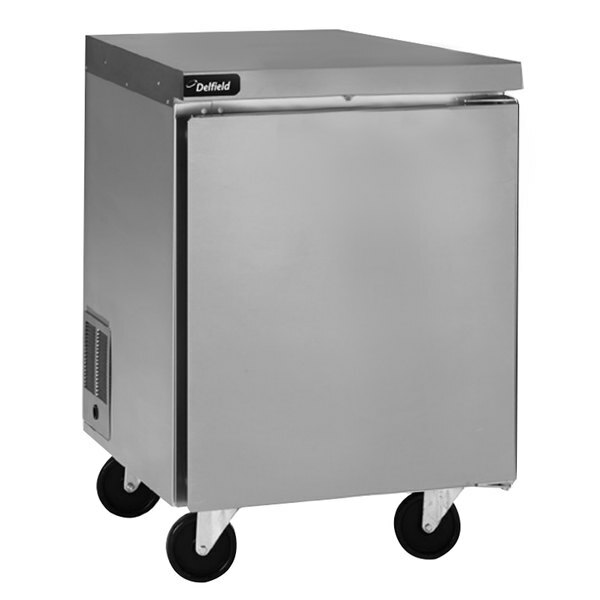 For ample food prep space and superior refrigeration, choose this Delfield GUF32P-S 32" undercounter freezer with flat top! This unit is a great way to provide out of the way, frozen food storage when space is a limiting factor. Its durable stainless steel top and front are great for commercial use and easy to maintain. Additionally, the aluminum interior is sturdy and provides you long-lasting use. Inside, the unit has 2 epoxy coated shelves that offer you optimal storage space. Plus, the self-closing door also has a 90 degree stay open feature, for easier product loading. An electronic control system also makes monitoring this model's internal temperature a breeze.